Beef cattle arrived with the First Fleet in 1788 but some of these escaped into the bush and became wild. In 1795 a herd of seven cattle were officially rediscovered, they were part of the herd that escaped in 1788. Attempts were made to control and tame them so they could be used as the basis of the colony's cattle industry. By the early 1800s a number of various breeds of cattle were imported which led to increased herds. John Macarthur and Reverend Samuel Marsden both had very large herds of cattle. Stockyards were erected in 1803 at Cawdor and by 1812 the Government Convict Settlement was established as a cattle station and the capture and taming of calves had been relatively successful. In 1822 Governor Macquarie revoked the previous order of prohibition to cross the Nepean River and granted land on and beyond the Cowpastures. John Macarthur eventually obtained a grant of 2,000 hectares to establish Camden Park and his flock of sheep. Cattle was successfully grazed in the early nineteenth century in many parts of Western & South Western Sydney With the crossing of the Great Dividing Range in 1813 more suitable grazing land was located and the industry began to expand. Cattle agistment was an important land use in Western Sydney. Cattle travelling from the west were rested so they could regain condition before going on to the Sydney markets. The Hawkesbury, Nepean and Auburn-Lidcombe districts were popular stop over sites. Wheat and maize were the staple food supply in the colony. The Hawkesbury was the major grower of wheat and maize early last century but as the settlement spread more appropriate sites were located. During the 1860-1870s most of the wheat industry was effected with the rust disease and this resulted with production figures dramatically reduced. Maize and other cereal production increased during this period. All types of vegetables have been successfully grown in most parts of Western Sydney. Originally settlers grew their own food supplies and some areas such as the Hawkesbury, supplied the Sydney markets. Over the years crops have varied from traditional vegetables to more diverse vegetables in the late twentieth century. Sheep arrived with the First Fleet in 1788 but were not noted as significant during the first decade of settlement. Early sheep breeders included Marsden, Cox, Hassall, Terry and the Macarthur's. Large tracts of land were required to graze sheep and places such as Parramatta, "Belle Vista" Seven Hills Farm and Camden were significant in the development of this industry. Another important site included Foveaux's Stock Farm at Castle Hill. The wool industry does not play a significant role in the economy of Western Sydney in the late 20th century. 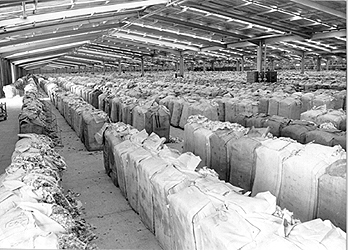 Bales of wool at the Yennora Wool Store in 1972. Acknowledgement : Holroyd City Council Library.